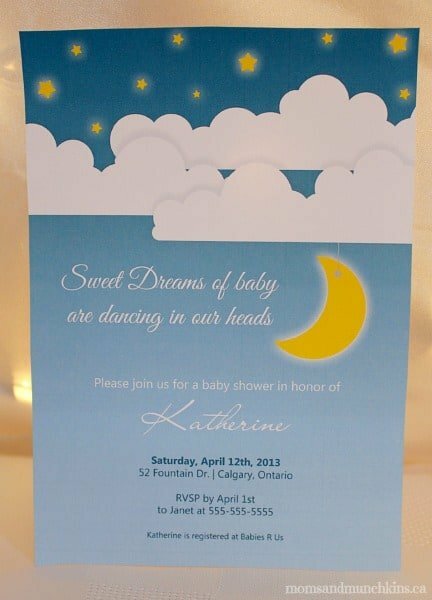 I’m so excited to announce our latest article in Calgary’s Child Magazine – Sweet Dreams Baby Shower! This was such a fun theme to put together. I love the twinkling lights! 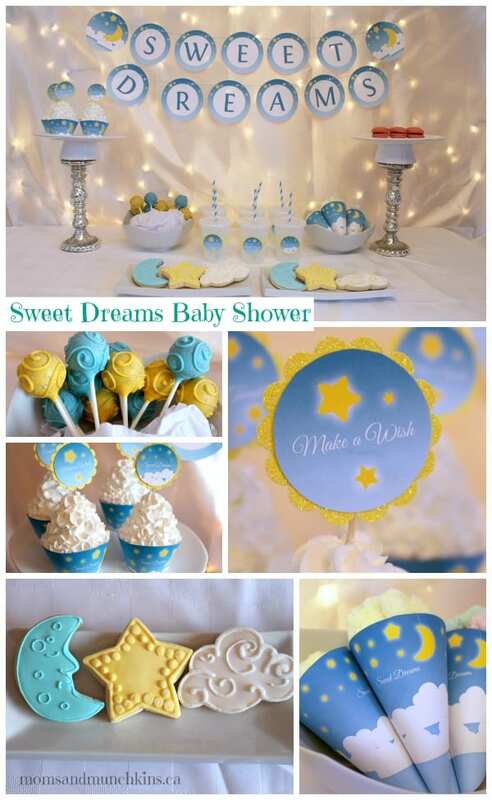 It seems like spring is a popular time for shower season – both baby showers and bridal showers. Are you attending any special parties this year? I don’t have any showers to attend but we do have a special birthday party coming up! 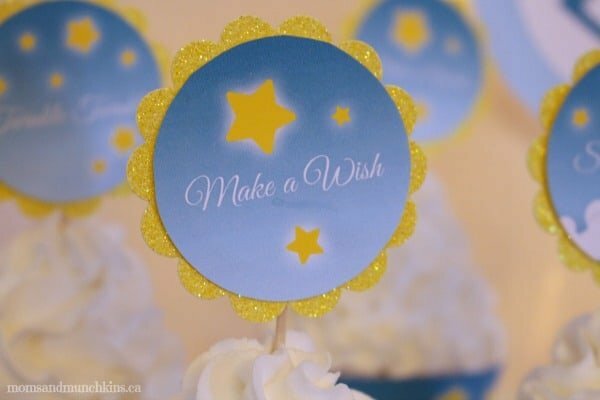 I’ll share all the party photos here with you but to view the full written article you’ll have to visit the Sweet Dreams Baby Shower article in Calgary’s Child Magazine. 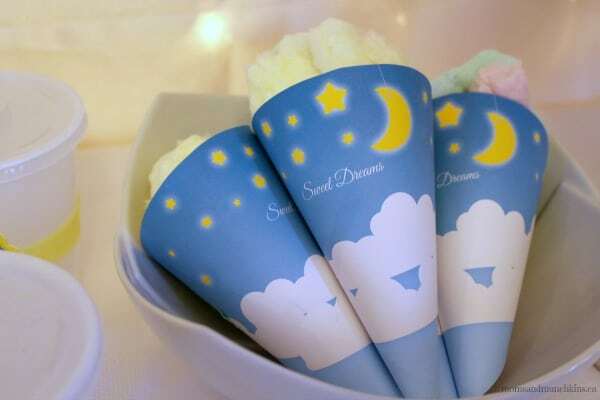 With a title like “Sweet Dreams”, you can bet that there will be a lot of sweet treats! 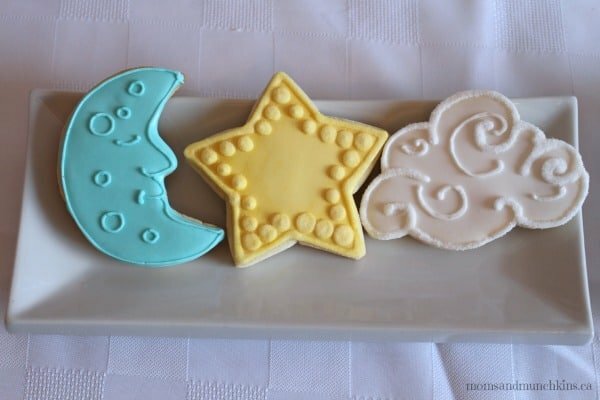 For this party I had cotton candy (like fluffy clouds), cake pops, cupcakes, macaroons and beautiful themed cookies. Looking for more dessert ideas? We have plenty of suggestions! For appetizer & potluck meal ideas, visit our Party Food page for more delicious recipe ideas. 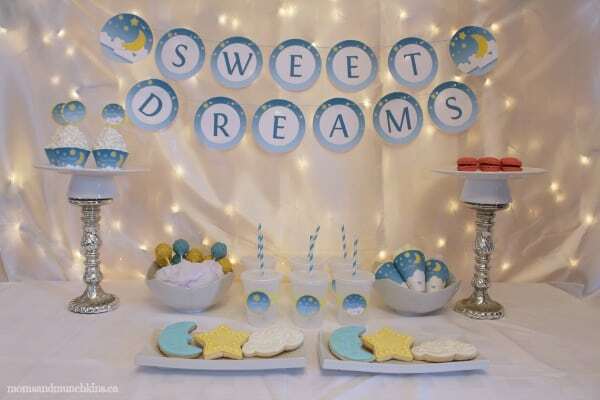 I wanted a lullaby feel to the party so I incorporated soft colors, clouds, stars and twinkling lights. Drag out those white Christmas lights! Party Games – some people love them and others avoid them. I think it’s a great way to get everyone chatting at a party. We have plenty of free printable shower games that you simply print & play! 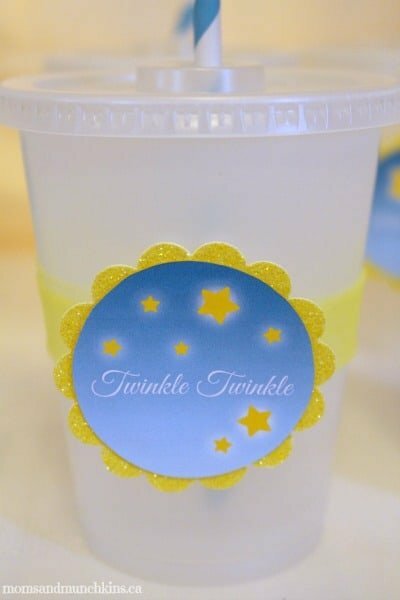 For more creative baby shower theme ideas, free printable games, planning tips and more, please visit our Baby Shower page. 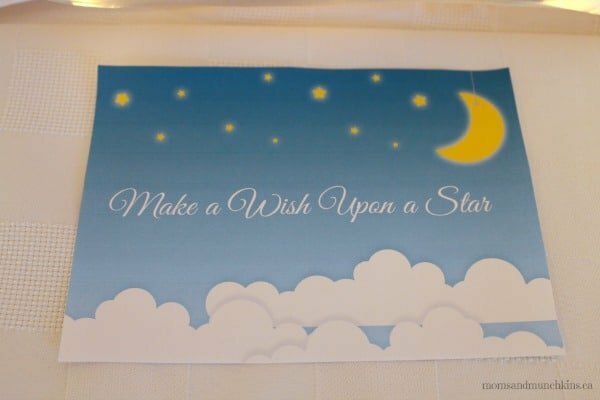 What a sweet theme for a baby shower. Everything looks beautiful. My weekly Say G’day Saturday linky party is on now and this post would be a perfect addition. Please stop by if you have a minute and Say G’Day! How can i order? I need all of these decorations? Please tell me how to order? 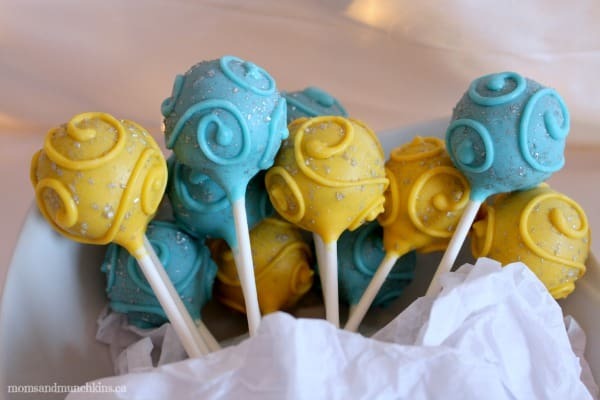 What type of frosting did you use on cupcakes in the photo that are just under the photo of the cake pops? Its the white and it looks fluffy, light as clouds, whipped and creamy. That looks completely different than any buttercream I’ve ever seen or made. Most people are usually turned off by buttercream due to the sugary texture and taste or the lordy texture or residue it leaves on your tongue because it’s so heavy. What did you use? May I please get your recipe for whatever you’ve used? .I know Wilton has a recipe for whipped frosting and I have one for cookies but it wont work for people with Gluten issues. Also, it is so hard to find tried-and-true GOOD TASTING gluten free cookies, cakes, Cupcakes, cake pop and dessert recipes for any type of parties or Gatherings. Hi Teresa! Funny story about these cupcakes – they aren’t real! Ha! 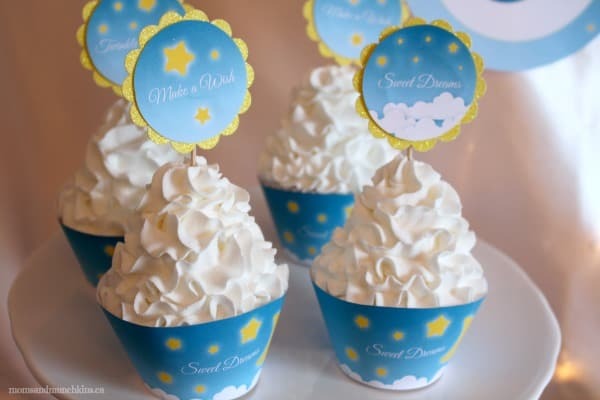 One of my favorite frostings is the one I used on the Slumber Party Cupcakes. If you head to the search bar at the top of the page and search “Slumber Party Cupcakes”, you’ll find the recipe. Thanks!